This is another really easy dish. I made it up as I went along and it came out great! Use whatever vegetables you have in the house. For the marinade, mix equal parts tamari and apple juice. Use your judgment; it should be enough to cover the tempeh. 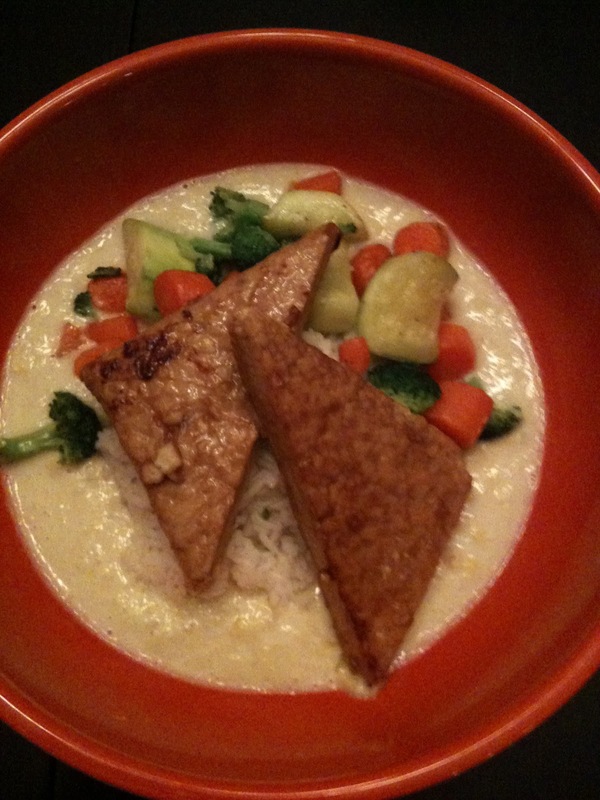 Cut the tempeh into triangles and place in the marinade. Let it hang out while you chop up the vegetables. Sauté them in olive oil, salt and pepper. Place the tempeh in a pan with sides, pouring all of the marinade in with it. Put it on medium heat and then cover it and let it simmer until the marinade is gone and there is a nice crust on the tempeh. Get the rice going at this point too. For the sauce, dice up an onion and sauté it in a little olive oil, salt and pepper. When it is translucent, add the corn. When the corn is cooked, add the coconut milk and stir. Pour into blender or use immersion blender (if your pot is deep enough) and process until smooth. To serve, fill the bottom of the bowl with sauce, a heaping portion of rice, veggies, and tempeh. Enjoy!